Like many gentrified neighborhoods of Seoul, to find the true gems of Samcheongdong, one must do some sleuthing. In the case of Dugahun, sleuthing is a bit of a stretch as it is already well known in the area and a popular visit for politicians, ambassadors, and other dignitaries. Dugahun is a restored hanok that was said to have been built between 1910 and 1920 on order by King Gojong for his mother. Because of this, Dugahun has a regal charm to it that’s evident as soon as you step onto its courtyard, complete with two ginko trees that dates back some 200+ years. Despite its undeniable Korean look, Dugahun specializes in fine Italian dining. Such a concept has been done before but Dugahun’s emphasis on the “fine” in fine dining is subtle but clear and it does so, rather remarkably, without diluting its Korean identity. As a hanok, the structure was meant to serve as a home and not a restaurant so Dugahun could have simply kept its exterior and enlarged the space to be on par with a standard restaurant but it chose instead to keep the space as is and true to its roots. Because of this, the restaurant has its limits in size, not only with floor seats for tables but even its kitchen is quite smaller than ones in a regular restaurant. This makes for a more limited menu but what it lacks in quantity, it more than makes up in quality. The menu offers a small range of dishes you can order ala carte or you can also order as a course meal. Dugahun takes extreme pride in their dishes, making sure to change their menu every two months. Their emphasis on the high quality of their ingredients is to the point that if, for some reason, an ingredient for a dish has fallen below their level of standard, they’ll simply stop making and serving that dish for the day. For my visit, the seasonal set menu went as such. Standard house bread, olive oil, balsamic vinegar to start. Herb marinated snail in mushroom with soft polenta, herb, and butter. Good earthy notes from the mushroom balanced with the herb sauce, creamy polenta, and cheese. Even for the snail squeamish in our party, this was perfectly fine for them. This was a winning combination of textures especially. A nice soup and salad. A bisque of some sort and nicely plated salad. Arugula, rocket, rucola, whatever you want to call it, I'm a sucker for these greens. Now this was a stellar dish. Grilled shrimp spaghettini with rosé sauce (creamy rosa sauce). The jumbo shrimp is so well seasoned and cooked to perfection I could probably eat a plate of them alone. What makes it even more delightful however is the creamy and decadent rose sauce and plump spaghettini cooked to a perfect al dente. The rose pasta and grilled shrimp are excellent on their own but together it makes for a swoon-worthy dish. If this was an ala carte main option, I wouldn't hesitate to order it again. And lest there remains any doubts that Dugahun knows how to cook, look no further than their Korean beef (hanwoo) tenderloin steak plate. An exercise in texture, flavor, and cooking method if anything. You have a bulb of garlic cooked to golden, sweet perfection, a dried plum wrapped in a bacon slice and roasted with a sprig of rosemary, creamed polenta, and a moist tenderloin seared to lock in the juices. Small fruit and cheese plate including espresso jelly. And once again, can I mention how gorgeous the setting of Dugahun is? It takes a bit of weeding to find the fine dining restaurants where the food matches the service and atmosphere. Dugahun makes solid marks across all three categories in a picturesque, Korean setting that makes it a fine dining option that's well worth a visit. Come out of exit 1 of Anguk Station and walk along Yulgok-ro for about 140 meters until you get to Samcheong-ro. 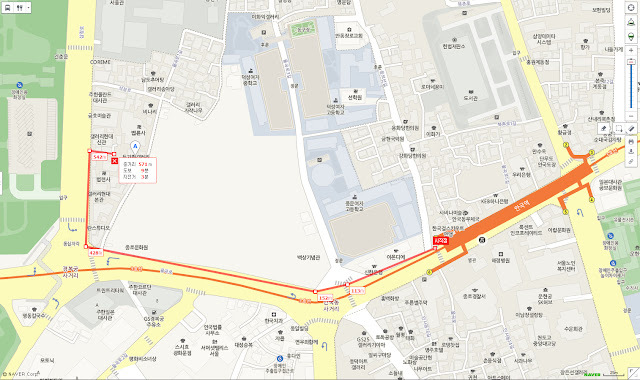 Turn right and walk north on Samcheong-ro for about 120 meters and there will be a narrow, small street between Gallery Hyundai and Beobryeonsa. Enter it and you'll come into the courtyard of Dugahun. They not only carry wine, they have a top notch cellar that carries over 5,000 bottles in some 320 brands and types. Last order is at 9PM. Please note that Dugahun does not allow children under 12 years old except on Saturdays. Outside wine welcomed though with corkage. Reservations are recommended for group sizes larger than six. You can even potentially snag the beautiful brick building/gallery for your dinner party!